My Irish Table by Cathal Armstrong and David Hagendorn is a mouth-watering, delectable cook book chock full of native Ireland recipes. From the classic Irish Soda Bread and Shepard’s Pie to the Roast Chicken with Pan Gravy and Potato Gratin, there seems to be a recipe to suit everyone’s taste buds! The food photography is brilliant and makes my mouth water in hunger. Armstrong, an Irishman, is an prominent chef in the United States who now owns multiple, thriving restaurants. In the introduction Armstrong gives the readers an overview of his journey beginning with his Irish roots as a young boy all the way to his success as a top notch chef who has served dinner to many celebrities including the President of the United States! What I particularly liked about this book though was not just the vast variety of Irish recipes, but the authors personal touch on each page. Throughout the book we get a glimpse into an Irish heritage that includes Grandma’s recipes and tips to make a better dish. Armstrong and Hagendorn know their craft and they know it well! The only critique I give this cookbook is that it might not be the best for a novice. I’m not one to whip up a 5 course meal every day (or ever) and because these guys are so good, the recipes can seem a bit daunting. Also some of the cooking lingo may not be good for your average chef either. 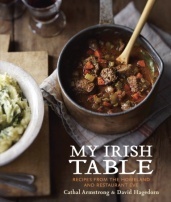 Besides that though, if you’re looking for some authentic Irish recipes with a unique twist, I highly recommend you get My Irish Table. Who knows? Maybe you’ll be cranking out 5 course meals in no time at all!